North Pole Summers Without Ice? Global Climate Model Projections – Arctic Surface Air Temperature60N – Pole: Change from 1990 to 1999 Mean. Source: International Arctic Research Center (IARC). November 2, 2004 Fairbanks, Alaska – More than 250 scientists and six circumppolar organizations, which have participated in the Arctic Climate Impact Assessment, will meet November 9-12, 2004, in Reykjavik, Iceland, to discuss recent warnings in the International Arctic Research Center’s (IARC) new report prepared for the eight nations around the Arctic Circle: Canada, Denmark, Finland, Iceland, Norway, Russia, Sweden and the United States. Submarines have been used to collect data about Arctic sea ice which has shrunk by 40% over a forty year period from 1960 to 1999. 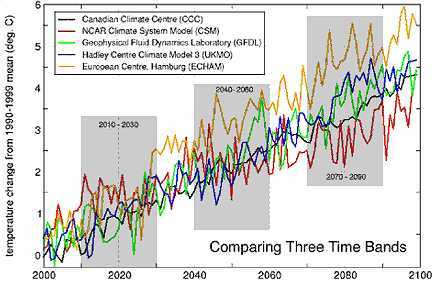 Global Climate Model Projects shown above indicate that for the foreseeable future, the temperature trend at the North Pole is ever-upward. Thus, the projection that beginning around the summer of 2060, all Arctic ocean ice will melt to a vast sea. What will polar bears and seals hunt from? What will happen to the 600 million birds that breed every year in the far north? Are those animals and others threatened with extinction now that global warming at the poles seems to be the future trend. As the ice melts entirely at the Arctic, the dark waters will not reflect back as much sunlight as the ice and snow has. So, as the ice disappears, the region will absorb more of the sun’s energy and heat up more causing more melt. 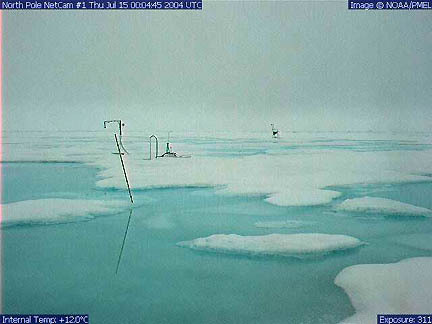 Melting North Pole photographed by NOAA NetCam#1, on July 15, 2004, at 4:45 UTC. Internal temperature was 12 degrees Celsius (about 54 degrees Fahrenheit). Image © 2004 by NOAA/PMEL. Next PostNext Gen. Wesley Clark – Has He Been Briefed About UFOs?